Having Trouble with Login In to your Members Account? Can’t complete a Purchase Transaction? Your browser cache can be helpful as well as harmful, temporarily storing website components such as images, scripts, and other page snapshots for quicker viewing whenever your revisit the same site down the line. It’s a convenient way of reducing bandwidth and perceived lag, along with load times, but it’s also a computing mechanism that can leave you in the stone age in terms of up-to-date viewing. 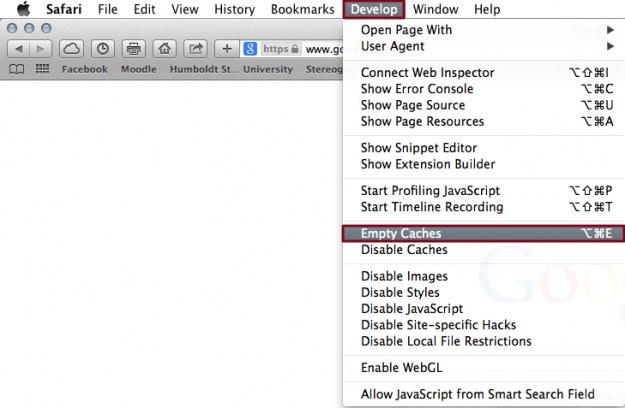 Therefore, nearly every browser features great tools for clearing the cache — if you can find them that is. There are several reasons clearing your browser’s cache can prove fruitful. First off, purging the stored data in your cache automatically forces your browser to seek and retrieve the most recent webpage elements instead of recycling the same old components. Furthermore, resetting your cache will potentially help in the event of 404, 502 and other errors potentially resulting from a corrupt cache, and clear any private data you have stored in the form of login IDs, passwords, and other sensitive information you’d rather not store on your machine. It’s also a simple trick you can employ to shed any unnecessary data, which could slow down your browser. 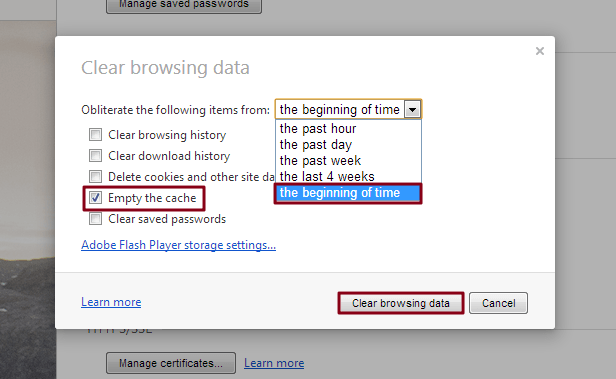 Here’s a guide on how to clear your browser’s cache, no matter which browser you use. Also, check out this this Video on how to reset Your Password and this guide on how to Reactivate Your Account if Clearing your cache does not fix your login issue. Step 1: Open the settings — Launch Google Chrome, click the Chrome menu icon represented by three horizontal bars in the upper-right corner of the browser window, and click Settings near the bottom of the resulting drop-down menu. 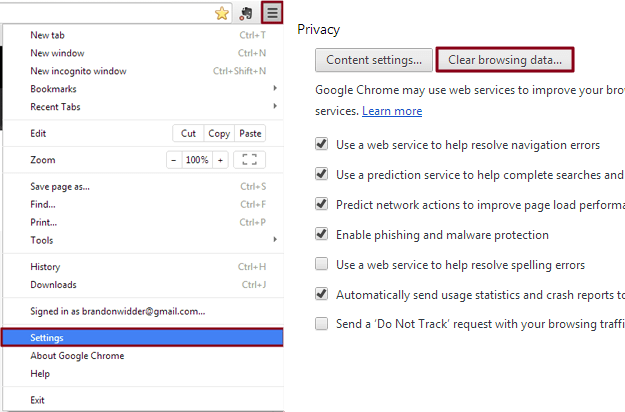 Afterward, click the blue Show advanced settings option at the bottom of the page, followed by the gray Clear browsing data button located beneath the Privacy section. 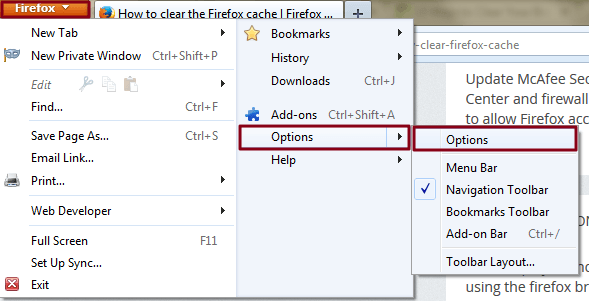 Step 2: Clear the browser cache — Check the box directly left of the Empty the cache option near the middle of the new pop-up window, along with any other browser data you wish to clear, and select the beginning of time option from the drop-down menu indicating how far back you wish to clear your cache. Afterward, click the gray Clear browsing data button in the bottom-right corner of the window and allow the cache to clear. Step 1: Open settings — Open Mozilla Firefox, click the main Firefox button in the upper-left corner of the browser window and select Options from the right side of the resulting drop-down menu. Afterward, click the Advanced tab located on the right-hand side of the navigation bar and select the Network sub-tab underneath. 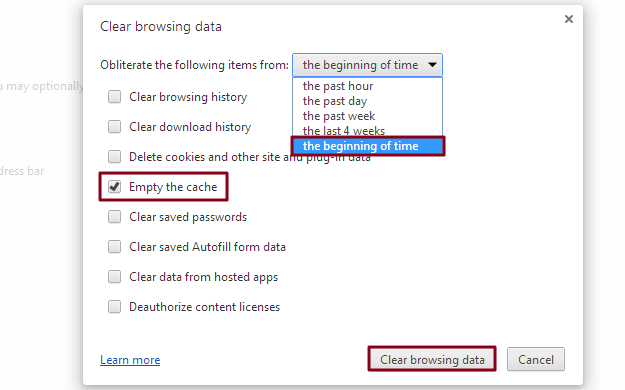 Step 2: Clear the browser cache — Click the Clear Now button within the Cached Web Content section near the top, then click the OK button on the bottom-right corner of the window. 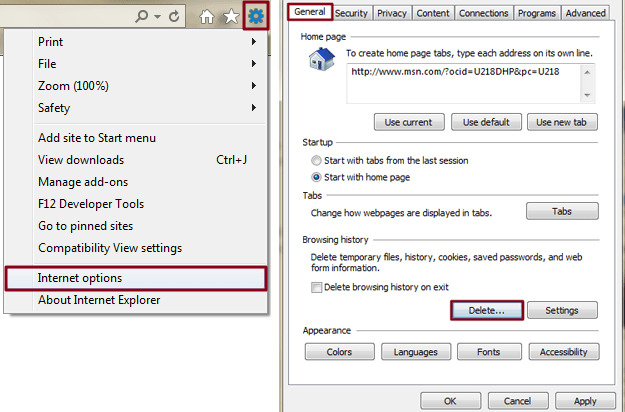 Step 1: Open settings — Launch Internet Explorer, click the Tools icon represented by the gear in the upper-right corner of the browser window, and select Internet options near the bottom of the resulting drop-down menu. Then, select the General tab located in the left-hand side of the navigation bar. 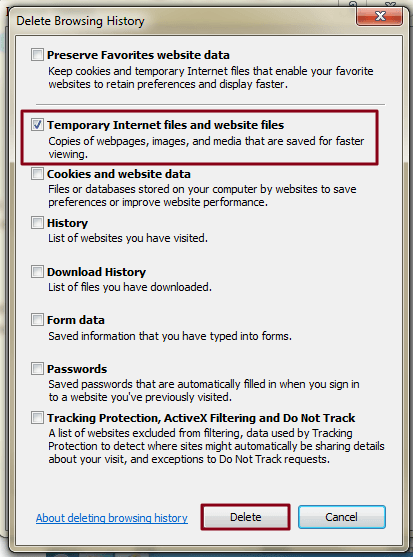 Step 2: Clear the browser cache — Click the gray Delete … button within the Browsing history section near the bottom of the resulting pop-up window, check the box directly left of Temporary Internet files and websites files — along with any other browser data you wish to clear — and click the gray Delete button in the bottom-right corner of the window. Step 1: Open settings — Launch Safari, click Safari in the upper-left corner of the main menu bar, and select the Preferences option near the top of the drop-down menu. Afterwards, click the Advanced tab located in the top navigation bar and check the box directly to the left of the Show Develop menu in menu bar option to add the menu to Safari by default. 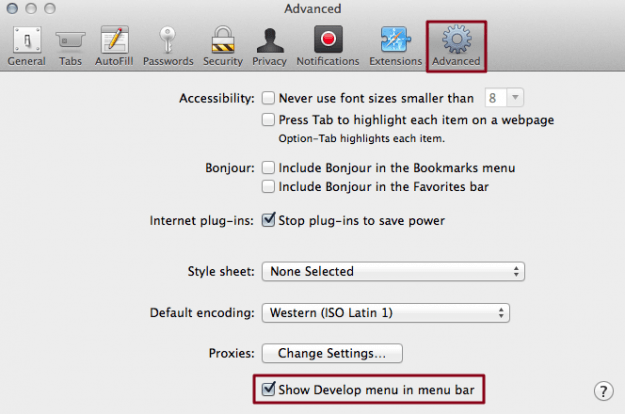 Step 1: Open settings — Launch Opera, click the main Opera button in the upper-left corner of the browser window and select the Settings option from the drop-down menu. Afterward, click the Privacy & security panel located on the left-hand side of the resulting window and click the gray Clear browsing data… button within the Privacy section near the top of the page. 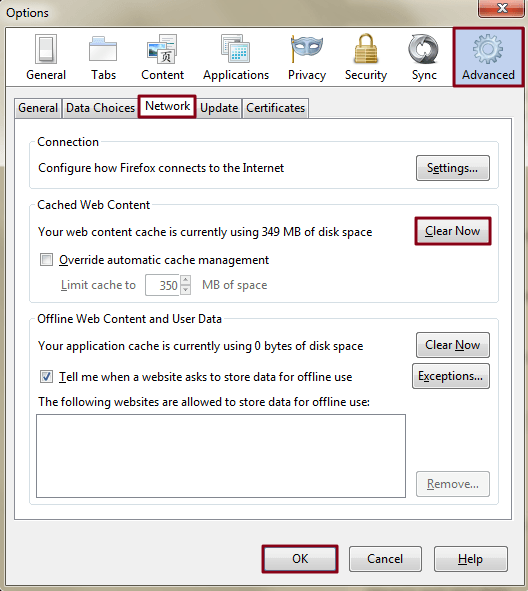 Step 2: Clear the browser cache — Check the box directly to the left of the Empty the cache option near the bottom of the resulting pop-up window, along with any other browser data you wish to clear. Then, select the beginning of time option from the drop-down menu. Afterwards, click the gray Clear browsing data button in the bottom-right corner of the window.